All the other muscles viz -the dorsal and plantar interossei, flexor digiti minimi brevis, flexor halluces brevis, flexor digitorum brevis, quadratus plantae (flexor accessorius), abductor digiti minimi, abductor hallucis, and lumbricals are on the plantar side of the foot in the sole where they are arranged in 4 layers. The muscles mainly customize and improve the actions of the long tendons and help fine movements of the toes. Except for the extensor muscle that is nervous supply by deep fibular nerve, all muscles of the foot have nervous supply by medial and plantar branches of tibial nerve. The deep fibular nerve may also partly supply nerves to the first two dorsal inerrosei. It’s a small muscle situated on the lateral part of the dorsum of the foot, deep to the tendons of extensor digitorum longus. It’s the only muscle on the dorsum of the foot and creates a fleshy swelling anterior to the lateral malleolus. The youthful beginner physicians sometimes diagnose it as a contusion. It originates from the anterior part of the superior surface of calcaneum, medial to the connection of the stalk of inferior extensor retinaculum. The muscle splits into 4 tendons for the medial 4 toes. The tendon to the big toe crosses in front of dorsalis pedis artery and inserts on the dorsal surface of the proximal phalanx of the big toe. 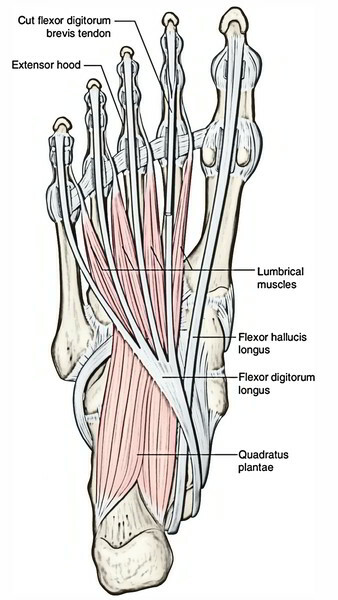 The Lateral 3 tendons join the lateral side of the tendons of the extensor digitorum longus to the 2nd, third, and fourth toes. Medial most part of the extensor digitorum brevis, which creates the tendon for the big toe, splits or becomes different early. It’s called extensor hallucis brevis. It’s by the lateral terminal branch of the deep peroneal nerve. 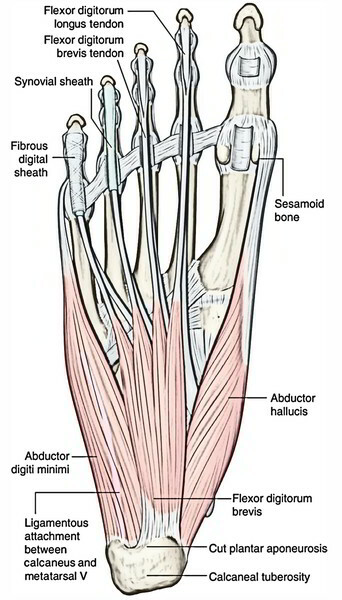 Extensor hallucis brevis (EHB) stretches the metatarsophalangeal joint of the big toe. The other 3 tendons stretch the metatarsophalangeal and interphalangeal joints of 2nd, third, and fourth toes, especially when the foot is dorsiflexed. The extensor hallucis brevis originates in conjunction with the extensor digitorum brevis. Its tendon attaches to the base of the proximal phalanx of the great toes. The muscle extends the metatarsophalangeal joint of the great toe and is innervated by the deep fibular nerve. It arises from the calcaneus, the interosseous talocalcaneal ligament and the inferior extensor retinaculum and it connects to the base of the proximal phalanx of the great toe. It helps the extensor hallucis longus in extending the great toe at the metatarsophalangeal joint. It is innervated by Deep fibular nerve. There are 18 intrinsic muscles and 4 extrinsic tendons in the sole of the foot. The muscles of the sole are described in 4 layers from superficial to deep. First layer 1. 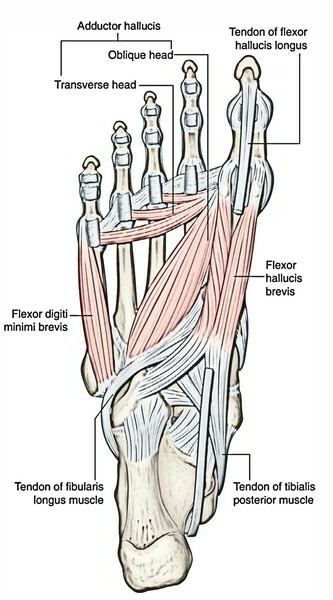 Flexor digitorum brevis. Second layer 1. Flexor digitorum accessories Four lumbricals. Third layer 1. Flexor hallucis brevis. 2. Flexor digiti minimi brevis. 3. Adductor hallucis 1. They are confined to the metatarsal region of the sole. Fourth layer 1. Interossei (3 plantar interossei and 4 dorsal interossei). 2. Tendon of tibialis posterior. The muscles of the sole are primarily concerned with supporting the arches of the foot. The short and long muscles of the foot serve as synergists. Superficial neurovascular plane between the first and 2nd layers. Deep neurovascular plane between the 3rd and fourth layers. In the superficial neurovascular plane is located the trunks of medial and lateral plantar nerves, and the arteries. In the deep neurovascular plane is located the deep branches of the lateral plantar nerve and artery. To understand the origin and insertion of the muscles of the foot the student must study the layout of the various bones on the plantar aspect of the skeleton of the foot. • Flexor digitorum brevis (resembles flexor digitorum superficialis of the hand) Medial tubercle of the calcaneum 1.It forms 4 tendons for the lateral 4 toes. • Abductor hallucis (lies along the medial border of the foot) 1. 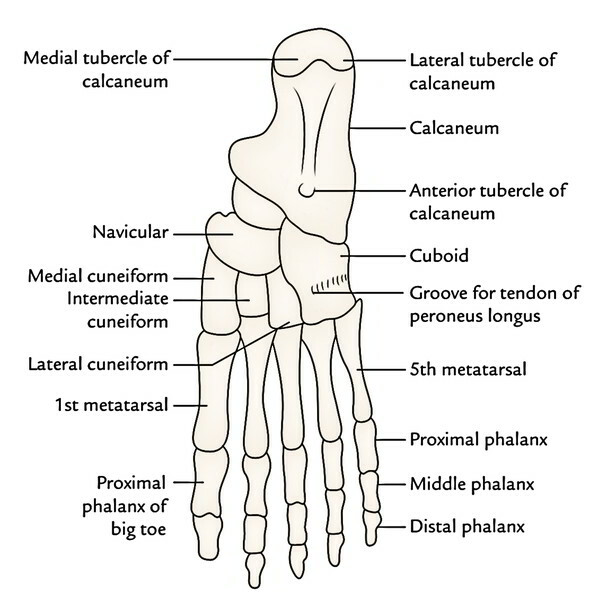 Medial tubercle of the calcaneum. 1. Medial head from the medial concave surface of the calcaneum and adjoining part of the medial tubercle. 2. Lateral head from the calcaneum in front of the lateral tubercle The two heads unite at an acute angle Tendon of the flexor digitorum longus (FDL) Lateral plantar nerve (S2, S3) 1. Straightens the pull of the long flexor tendons. 1.Lateral limb from the medial part of the plantar surface of the cuboid bone. 1.Large oblique head from bases of the 2nd, 3rd, and 4th metatarsals. .2Maintains transverse arches of the foot. • Dorsal interossei * (4 in number, and lies between the metatarsal bones) They are bipennate and arises from the adjacent sides of the metatarsal bones (1-5) Tendons are arranged on the abductor sides of the toes 1.1st on the medial side of the proximal phalanx of 2nd digit. 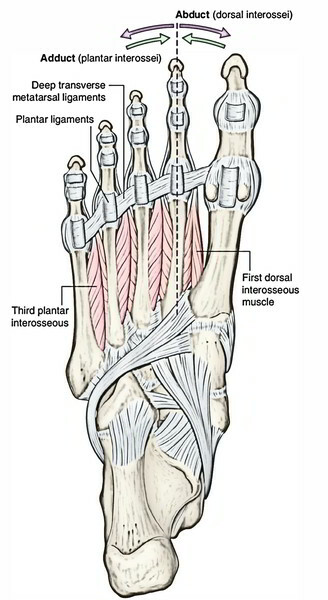 2nd-4th on the lateral sides of 2nd-4th digits Lateral plantar nerve (S2, S3) 1.Abducts digits (2nd-4th). 2. Flexes the metatarso-phalangeal joints. Plantar interossei * (3 in number and lies rather below the metatarsals) They are unipennate and arises from the medial sides of the metatarsal bones (3rd-5th) Tendons are arranged on the adductor sides of the toes Medial sides of bases of the phalanges of 3rd-5th digits Lateral plantar nerve (S2, S3) 1.Adducts the digits (2nd-4th).